Dinosaurs: Red Triceratops Knitted Dinosaur Soft Toy. 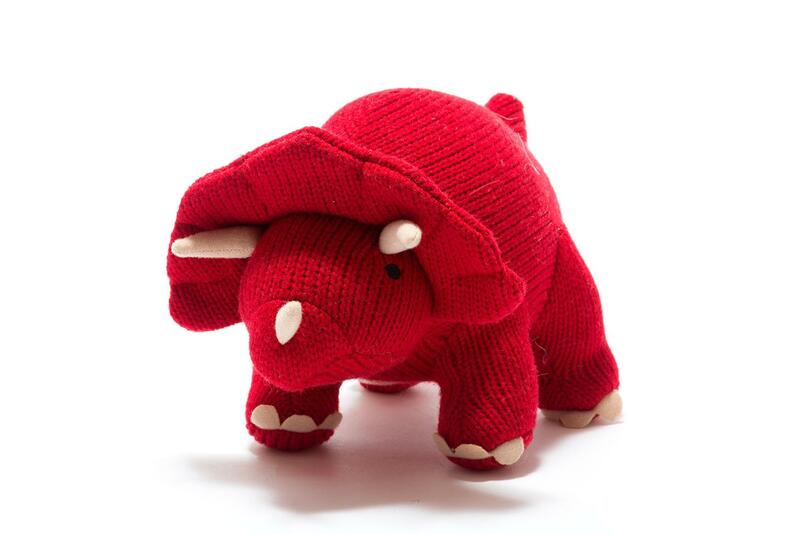 In a striking red colour our Triceratops dinosaur toy makes a great soft toy for all ages. Although its called a Triceratops it really should be a Diatops because this dinosaur actually only had 2 real horns - The little one on his snout was not actually made of horn. Whether its a Triceratops Dinosaur Toy or a Diatops Dinosaur Toy our knitted red dinosaur toy is a perfect toy for dinosaur mad kids. Machine washable and suitable from birth. Dinosaur toys for toddlers don't get much better than this! Size approx length 30cm x height 14cm, Dimensions can vary and are given as a guide only. 100% acrylic. Ethically sourced. I love this toy. Its really fun and the colour is great. Its much better in real life than in the photos. You are never too young or too old to like dinosaurs and this is much better than the plastic ones from your average shop.